A bulkhead is the material partition such as a wall, curtain or screen that divides an airplane into various classes or sections. Bulkheads are also found throughout the plane, which separates seats from restroom areas and galleys. Since there are no seats in front of a bulkhead seat, additional legroom allows you to stretch comfortably. 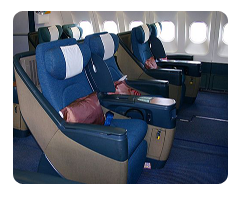 Bulkhead seats also means that passengers can not recline into your space limiting your ability to move in your seat. You are able to stand up or move about freely without disturbing the row you are seated in. If you opted for a standard bulkhead seat, it limits legroom. Although small, your storage space is minimized. For example, a carry-on bag must be placed in the overhead compartment rather than underneath your seat. For convenience purposes, this may be an issue. Handling trays are limited, so tray tables for bulkhead seats are placed in seat supports. Consequently, this makes the armrest fixed and reduces seat width. If you are flying on an airplane which provides you with personal televisions, the same will also be placed in the armrest reducing seat width.